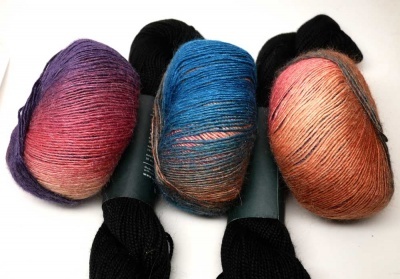 Kit A will include one skein each of Embrace and Abyss. 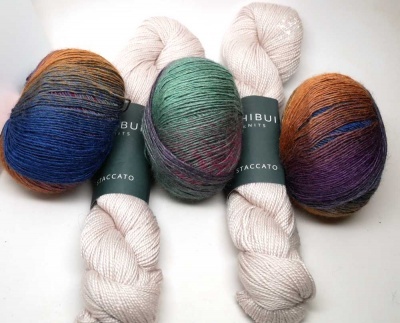 Kit B will include one skein each of Iridescent and Bone. 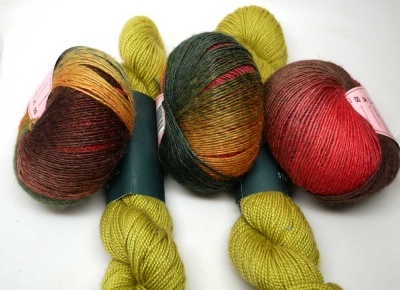 Kit C will include one skein each of Thanksgiving and Apple. This and the following photos show the original cowls as knit by the designer, all © Marin Melchior. The Butterfly Cowl is another design by Marin Melchior that is just so lovely and such fun to knit, I simply had to put together some kits. Please plan to get the pattern via the designer's Ravelry page here. 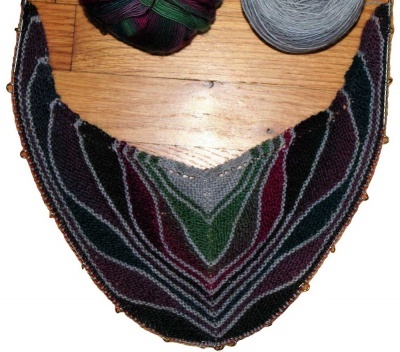 What we offer here are kits of yarn only, specially chosen to work with this design. 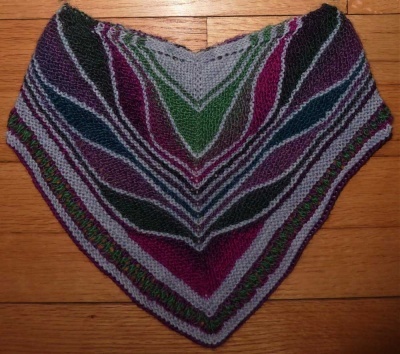 Basically this piece uses the same techniques as her stunning Butterfly/ Papillion Shawl. 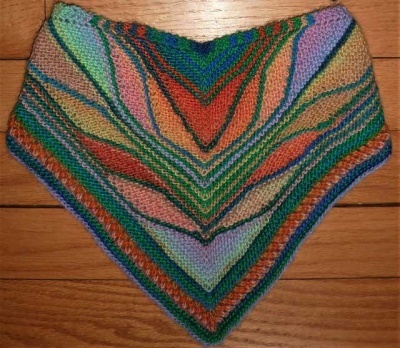 This is a little sampler of the Butterfly/Papillon Shawl pattern. and dip your toes into the techniques of a larger project. it is designed to be a fun, wearable piece of art. 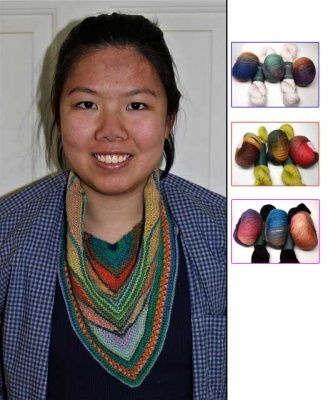 Our kits use different yarns than the ones Marin used in her original cowls. You can see our kits on the right side of the top photo on this page and again below that. When I wrote to Marin about yarns that worked well in this design, she responded to note that it uses very little yarn in total, only about 100 yards of a yarn with long color runs and about 80 yards of a solid or tonal contrast skein. The most important thing being, "....a nice contrast sets it all off well I think..."
We brought in some solid colors of Staccato from Shibui Yarns, a 70% superwash merino/ 30% Silk blend with 191 yards (175m) per 50g skein. And for a long color run yarn we have put together some colorways in Amitola, This is a 80% Wool, 20% Silk with 273 yards/ 50g ball. Notice that each photo below shows three Amitolas and two Staccatos. This is because each Amitola looks somewhat different depending on where in the colorway it is wound from. Each kit will consist of one skein of each. And actually you should have enough yardage in one kit to make two cowls. Kit A: The Amitola is called Embrace. It includes teal, brown, rose, and purple. The Staccato is Abyss, a pure black. Kit B: The Amitola is named Iridescent and includes blue, golden brown, violet, green, and rose. The Staccato is Bone, a pale neutral ecru. Kit C: The Amitola here is Thanksgiving, with gold into green into grown into orange. The Staccato is Apple, a bright yellow green. 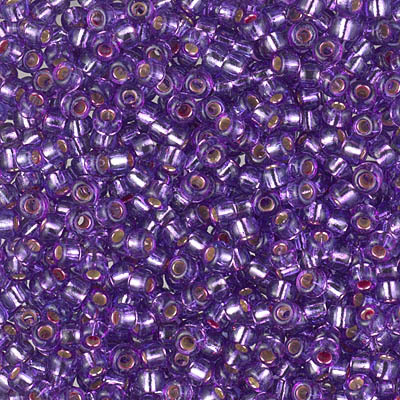 No, no beads in this pattern. But I cannot help but think that a few well-placed beads around the bottom edge could be a gorgeous addition. Let me know if you'd like a few suggestions.